In this article we report and reflect on the responses to a questionnaire survey administered to 600 parents/caregivers, whose Foundation Phase children attend a former Afrikaans-medium primary school where English is now the sole medium of instruction, although English is not spoken as home language by either teachers or learners. We explored reasons why parents chose this particular school, especially in the light of available alternatives as well as their views of mother tongue/English instruction. At present, many parents favour an approach that also nurtures the home language, even while support for an English-only approach is strong. It may be that well-established research findings on the pedagogical and social benefits of maintaining home/local languages are being heard, at least among younger and better educated parents. This article stems from a case study of parental school choice which was nested within a longitudinal, qualitative enquiry on the pedagogical and social consequences of using English as the language of teaching and learning in multilingual classrooms (Evans & Cleghorn, 2012). In the study reported here, we sought to pin down parents' reasons for selecting a particular school for their Foundation phase children, a question that arose from, but was not fully explored, in the qualitative investigation. Since all parents in South Africa are now constitutionally free to choose the school that their children attend, we framed this case study in terms of parental preferences in school choice. We couch the findings in theoretical terms of language waves (researchers' own coinage) rather than language shift, since from our perspective the language of instruction situation in South Africa is in constant flux rather than moving from one language (and culture and identity) to another. It is thus quite possible that a different picture regarding parental choice of schools or instructional language(s) for their children may emerge over the next decade. More specifically, we sought to determine the extent to which access to instruction in English might outweigh other considerations such as the school's distance from home or cost of tuition and whether an English-only experience is what parents actually want for their children. Although not investigated directly, we also hoped to get a reading on whether parents/caregivers are aware of the potentially negative social and pedagogical consequences of a 'straight-for-English' practice i.e. the use of English only for instructional purposes from grade 1 onwards (Benson & Kosonen, 2013). Since much is yet to be known about school choice in South Africa, we posed the following main research question: What factors - in addition to the language of instruction - do parents consider when selecting an urban school for their Foundation Phase1 child? In the first section we review the historical and socio-cultural/linguistic context of the research. Next we describe the methodology used to survey and analyse the responses of 600 parent/caregivers whose children attend one former Afrikaans-medium primary school where English is now the sole language of instruction. The results of the survey are then presented, followed by a discussion. For generations, regardless from which community, most South African parents had little, if any, choice in the schools their children attended. The government of the day determined access to state schools based on immutable racial and zoning policies closely linked to socio-economic and linguistic factors. Private schooling was expensive and primarily religion-based (Booyse, Le Roux, Seroto & Wolhuter, 2011; Ndimande, 2006). In 1994 South Africa became a true democracy after decades of oppression and inequality. Although the political control of apartheid has dissipated, issues related to redress in all spheres of life - economic, education, and social - are still in flux. Many learners have not yet enjoyed the promise of equal and quality education for all as encapsulated in various legislative documents, such as the national Constitution, and South African Schools Act (Department of Education, 1996) which includes a framework for school governing bodies (SGB). Black parents especially, now seemingly have more options yet the choice generally entails much financial sacrifice related to increased transport costs, high tuition fees, school uniforms and extra-mural expenses (Lombard, 2007; Msila, 2005). There is ostensibly a greater choice even with regards to the medium of instruction of a school, as the Constitution offers parity of esteem to 11 official languages, and vouches for learners' right to be taught in a language of their choice where reasonably practicable. This phrase, however, indicates that the right is not guaranteed. Parents - as represented by a democratically elected school governing body - do have the power to choose the language of instruction in a particular school, however, it is evident that many parents go to great lengths seeking English as the sole medium of instruction - a trend evident in other parts of Africa (Benson, 2004; Bunyi, 1999; Busch, 2010; Cummins & Hornberger, 2007; De Klerk, 2002; Holmarsdottir, 2005; Maile, 2004; Msila, 2005; Stroud, 2002; 2003; Woolman & Fleisch, 2006; Wolfaardt, 2005; 2010; Wong-Fillmore, 1991). South Africa is not alone as a multilingual country in the southern African region nor are its language-in-education policies uniquely problematic (Nkosana, 2011, Mooko, 2009, Papen, 2007; Prah, 2009, Wolfaardt, 2010). Like so many African countries, the lure of English is difficult to resist. This linguistic magnetism is inextricably linked to a colonial history and a current capitalist economic system. High levels of proficiency in English persist as "the distributor of power" (Nkosana, 2011:11). In Botswana for example, one finds Setswana and English as official languages with Setswana used for instruction in grades 1 to 4. However, since 2002 the policy has changed to make English the language of instruction from Grade 4 and there is "absolute silence on the role of other languages in building national unity" (Mooko, 2009:27). In Namibia, despite a call for a transitional bilingual programme that would see early literacy established in several mother tongue languages, the reality sees English used most often from the start. This is the case despite the fact that learners in the rural areas have very little daily exposure to English, resulting in serious delays in reading for understanding (Wolfaardt, 2005). Benson (2004) attributes such persistent patterns in misguided language policy to the fact that those in policy making positions tend to hold a monolingual view of the world, or quoting Gogolin (2002) to a monolingual habitus. Such a habitus fails to recognize "multilingualism as a social and individual reality that requires appropriate designed approaches" (Benson & Kosonen, 2013:284). She argues for a multilingual habitus that acknowledges rather than ignores the resources that learners' proficiency in non-dominant languages bring to the classroom. Keeping a multilingual habitus or lens in mind, English or Afrikaans-speaking learners in South Africa are currently able to complete their entire schooling and even post-matriculation qualifications in their mother tongue. Speakers of African languages are less fortunate. The official additive bilingualism policy determines that state schools offer mother-tongue instruction (an official African language) for the first three years of formal schooling, with a gradual and well-planned introduction of an additional language, usually English. Grade 4 learners are then subject to an abrupt switch to English as medium of instruction. This happens in most township and deep rural schools implying that parents could opt for initial mother tongue education. However, these schools remain seriously disadvantaged in terms of resources, and quality teaching (Bloch, 2009; Lombard, 2007; Maile, 2004; Msila, 2005; Ndimande, 2006; Woolman & Fleisch, 2006). The current language-in-education situation is complex due mainly to South Africa's language history but also now to internal migration, regional differences and attitudinal factors. Regional distribution of languages and their local varieties implies that there is no typical linguistic compo sition in a South African classroom. Rather, the linguistic profile of learners tends to be regionally specific with some classrooms more homogeneous than others. Most provinces have adopted a policy of English plus the two most commonly spoken local languages to serve as media of wider communication. Constitutionally, citizens may use their mother tongue for all reasonable purposes but teachers' language proficiencies, practicalities and cost militate against this happening effectively in the classroom. In urban areas the situation is particularly complex since classes are increasingly linguistically heterogeneous making it impracticable for schools to abide by the official language policy. To elaborate, the use of vernaculars in the South African classroom has an unfortunate history associated closely with apartheid and the notorious Bantu education system. Instituted in 1953, this system, or policy, although advocating mother tongue instruction for seven years for black children, also introduced an inferior and very poorly resourced system. This, in addition to the historically-rooted fear of being kept marginalised and subservient, keep many parents suspicious that learning via the mother tongue "delays access to English commonly viewed as the gateway to modernity" (Heugh, 2005:243). English is also seen as the language of political and economic liberation (Lombard, 2007; Maile, 2004; Msila, 2005). Clearly, the basis upon which parents make choices with regard to their children's schooling is not simple, but stems from their knowledge of the past and the goals that they entertain for their children's future. It is not only a matter of accessing better resources associated with former white segregated government (Model C) schools. There are also trade-offs to be considered; in our study more than 50% of parents lived further than 5 km from the school, suggesting that attendance at meetings with teachers or other aspects of participation in their children's schooling might not be easy. It remains curious that in post-apartheid education a colonial language rather than any of the indigenous languages is favoured as a language of learning and teaching. Elsewhere in Africa, education systems have been "looking for ways to promote literacy in the vernaculars as a means of erasing the colonial legacy" (Marjorie, 1982: 19; see also Benson, 2004; Brock-Utne, 2005; Stroud, 2002; 2003). The strong rejection of these languages as the language of learning and teaching in South African communities appears to stem from the historic association with the pitiable quality of Bantu education and adds to the intricacy of the current language-in-education debates (Lafon & Webb, 2008). This history and the associated parental attitudes stand in contrast to current research in the field of second language and bilingual education which solidly advocates maintenance if not also development of home languages in school along with full access to English or other international languages such as French, Spanish or Portuguese (Alexander, Bamgbose, Bloch, Busch, Coste, Edwards, Fal, Ndumbe & Samassékou, 2007; Benson, 2004; Benson & Komonen, 2013; Cleghorn & Prochner, 2010; Heugh, Siegrühn & Plüddemann,1995; Kamwendo, Jankie & Chebanne, 2009). People's Primary - declared a national monument in 1986 - is a former all-white, co-educational primary school now cordoned-off by the closure of boundary streets in a very busy part of a large city in Gauteng. The local neighbourhood is ethnically heterogeneous and has attracted persons from all over Africa; today few white people reside in the neighbourhood. The community comprises largely working/lower middle class residents who trade informally, run small businesses, or work in the bustling shopping centres or offices. People's Primary became of particular interest for this study based on its unique and lengthy history. Historically, this school served the Dutch-speaking community of the Zuid-Afrikaansche Republiek. In 1890 it began with 19 learners and Dutch was the un-contested medium of instruction. By 1902, after the Anglo-Boer war, numbers had risen to 120 and People's Primary was considered one of the leading Christian National Education (CNO) schools. By January 1904, six classrooms and a gymnasium were erected; only eight years later, six more classrooms and an office were added. In 1925 Afrikaans was declared an official language and in 1933 the school governors introduced it as an additional language of instruction making People's Primary a parallel medium school, Dutch and Afrikaans. Eleven years later in 1943, Dutch was phased out and instruction took place solely in Afrikaans. In 1993, shortly before the democratisation of South Africa, People's Primary once again became a parallel-medium school, Afrikaans and English. Since 2003, English has been the sole medium of instruction. As apartheid laws were abolished, the neighbourhood surrounding People's Primary became increasingly diverse. The demographics of the school have changed so fundamentally that currently almost 1,800 black African learners are served by 56 staff members, the majority of whom are white although none speak English as a mother tongue. All teachers meet the minimum four years of academic preparation to be appointed to government schools. 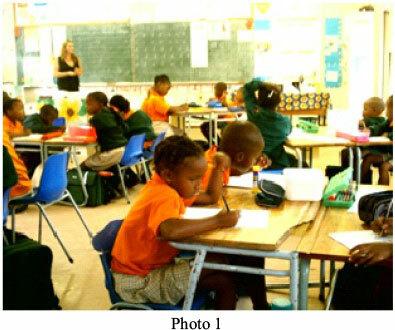 Although some classes have ±45 children, crowding is not evident and classrooms appear adequate in terms of number, size and standard resources such as seating, overhead projectors, chalkboards and print material as can be seen in Photo 1 and Photo 2. The school is well-resourced compared to many still-impoverished schools found in peri-urban townships: there is electricity and running water with sufficient toilet facilities. The brick buildings are large and well maintained. Sufficient grassed and asphalt areas are available to learners during breaks which double up as playing fields for soccer or netball. A large indoor hall serves as a meeting place for assemblies, some physical and cultural activities and parent gatherings. The main entrance to the school campus is guarded by a private security company and visitors show identification and sign in before being permitted on the grounds. Over 50% of parents bring their children to People's Primary from surrounding townships evidently in search of a school that could offer their children a better quality education as a former Model C school. People's Primary is categorised as a national quintile 5 which implies that it receives US$76,000 per annum from the government.2 Only 7% of the learners qualify for partial or full-fee exemption when parents are unable to pay the school fees of approximately US$1,000 per annum. English is regarded as the common medium of communication within the school administration although parents are served in various South African languages at the reception desk. 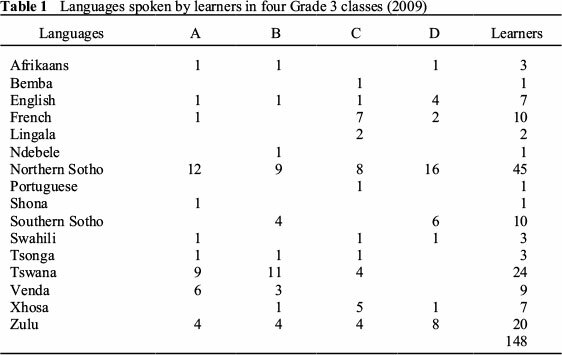 However, 17 languages - eight of which are spoken in other parts of Africa - were represented in four Grade 3 classes (A,B,C,D) as seen in Table 1. You know, the challenges that we have in our school is the fact that, you know, the teachers, most teachers in our school, the majority of teachers are Afrikaans speaking teachers. So they also have to adapt to the new language stream [policy] in our school. And then we have also black teachers in the school and it is also not their home language so that was, I think, you know, from the teachers' side they have also to adapt to that. But my problem in our school is the fact that the children are now being taught in a second or a third or a fourth language which is not their home language. We have got children from Nigeria; we have got children from Burundi. We have got children from Mozambique, Zimbabwe, all over Africa. And that is our problem, it's not so much from the teachers' side but the problem lies with the ability of children to speak the language when they enter the school. You know they come in, some children they can only speak French and not a word of English, and then we have to teach them [in English]. I think there are so many success stories that we have but I think that is the challenge, that they come to our school and they don't understand or speak a word of English. And we have to start from scratch. And you know what? The other thing is that they do not start in Grade 1 or Grade R. You know some of them come to our school in Grade 7 and then we have only that limited time [before they graduate to secondary school] to help them... .Yes that is our challenge or mine as a principal. Then another thing is, you know, some of our parents also have difficulty with the language so they cannot help their children at home because they cannot speak the language themselves. Several institutional steps were followed in order to obtain permission to conduct the research project in People's Primary and to ensure that ethical principles would be adhered to. A letter was sent to the school principal and followed by face-to-face meetings to explain the nature of the study. Information meetings were then held with the head teacher of the Foundation Phase and with teachers of the grades in question, Grades 1 to 3. We explained that this was part of a larger study, and that we were interested in why parents/caregivers had chosen this particular school, especially when there were three other possibilities in the vicinity. To address the main research question - what factors in addition to language of instruction do parents consider when selecting an urban school for their Foundation phase children? - a once-off questionnaire survey was administered to over 600 parents/caregivers. We used the broad term caregivers to imply any adult who takes legal responsibility for the physical and emotional well-being of the child or children living in the household. Four teachers and the principal were interviewed as well, on several occasions. This article draws primarily on the questionnaire data. The questionnaire was piloted informally3 and revised before being prepared for dissemination by a statistician experienced with questionnaire construction and the conventions of coding. Instructions in English were simple and we anticipated that the survey could be completed within 20 minutes as all questions required only tick-box answers, a format that would be familiar to most, if not all parents/caregivers. The first set of six questions sought biographical information in order to determine a parental profile and how the household was comprised. The next 11 questions elicited information about such matters as languages spoken at home with parents, grandparents and children, parents' ability to use English and their views of South Africa's language-in-education policy for the Foundation phase. The third set of questions asked parents/ caregivers to rate - on a four-point Likert-type scale ranging from extremely important to does not apply to me - the importance they place on 19 statements which suggested reasons for sending their child(ren) to People's Primary. The final set of 12 items asked parents/caregivers to rate on a four-point scale ranging from agree fully to does not apply to me, the importance to them that their child(ren) learn English and the importance of maintaining the mother tongue. The questionnaires were printed and packaged per class and hand-delivered to teachers responsible for teaching Foundation Phase learners (Grades 1-3). The questionnaire was sent home in May 2011 via the eldest child of each household. An accompanying letter explained the research project. Parents were assured that completion of the questionnaire was voluntary, that their responses would remain anonymous and that there was no possible consequence for the child(ren) should they choose not to return the questionnaire. Based on information obtained from an interview with the school's phase organiser, it was assumed that the level of respondent literacy was sufficient to understand and complete an English questionnaire. Due to the afore-mentioned protection of the respondents' anonymity, there is no way to determine if difficulty reading English explains any of the unreturned questionnaires. Of the 600 households, 356 returned the completed questionnaires. A response rate of 59.3% was thus achieved thanks to the established routine of class teachers who assisted in disseminating and collecting the questionnaires. It needs to be emphasised that the sample was not randomly selected, so the findings cannot be generalised. This being said, the findings provide a 'snapshot' of school choice in one large heterogeneous school population within a particular urban region in South Africa where the language of instruction has become English. This change over time has been observed in several parts of South Africa, thus the reader may find that the findings are transferable to other settings (Alexander, 2000; Lafon & Webb, 2008). The initial responses to each questionnaire item were tabulated and recorded on an Excel sheet. Descriptive statistics were then provided by entering the data into the statistical package for the social sciences (SPSS). Responses to each question were then scrutinised via cross-tabulations (chi-square and t test) to allow for a more qualitative interpretation of the respondents' reasons for selecting People's Primary school for their children's schooling. Tables were generated to give a clear overall picture. As Table 2 shows, while 94.4% of respondents indicated their status as parents, three times as many mothers as fathers completed the questionnaire (68.2%mother; 26.2% father). There is no way to determine if parents collaborated in providing the answers. Guardians or grandparents constituted 5.6% of the respondents. Official school records and informal discussions with teachers suggested that there were no child-headed households. The respondents were asked what language they spoke most often before the age of 6. All 11 official languages were represented in the answers; however Northern Sotho and Tswana (48.1%) predominated. Other indigenous languages spoken on the African continent included Bemba, French, Kiswahili, Portuguese, Shona and Tigrinya. When asked what languages the parents/caregivers used with grandparents, 21.2% reported Northern Sotho and 13.3% reported that they spoke Tswana. All respondents declared themselves as multilingual with 24.1% indicating English as a language they spoke well while 17.1% stating that they had started learning this language at the age of 10. This correlates with an Apartheid language policy whereby black learners received mother tongue instruction in the Foundation phase with a switch to English in the higher primary grades. Eighty-nine percent (89.5%) of respondents stated that they spoke English every day while 5.6% said they spoke it very seldom. This suggests a marked change towards an urban lifestyle which would, no doubt, also be influencing their choice of English as the language of learning and teaching. 34.3% use English as means of communication at work while 16.1% used it to speak to people from other countries. 82.5% rated themselves as having an excellent understanding of English. 86.3% of parents/caregivers understand their mother tongue well while this percentage was higher for the Grade 3 parents at 91.1%. More than 50% of learners live beyond a 5-kilometre radius of the school, suggesting that parents are willing to travel or pay for transport to ensure their children's access to a well-resourced and well-governed English-medium school. Of interest is the fact that there are four English-medium primary schools within less than three kilometres of each other. People's Primary is the only one with an Afrikaans history while the other three have been English-medium schools since their inception. The reasons cited for choosing this particular school were quite varied (the questionnaire allowed for multiple reasons to be selected): 46.5% stated that the fact the school is located close to where they live is important; another 60.3% stated that the school is close to where they work, again suggesting location is an important factor in school choice; and 81% reported that they had based their choice on the reasonable school fees. It is of note that the fees are comparable with any of the other English-medium primary schools in the vicinity. Inexplicably, 14% of respondents declared there was no other choice of school. Significantly, the reason which received the highest percentage response (95.3%) was provided for the firm discipline the school apparently maintains. Parents/caregivers also reported that the school has well-known high standards, and ample resources, however the Foundation Phase learners are, in fact, taught in pre-fabricated classrooms while the senior classes are taught in new brick buildings across the road built by the city council when they moved the school a few kilometres from its original site several years ago. 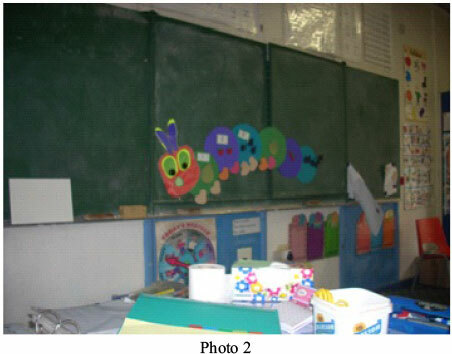 Classrooms are cheerfully decorated by the teachers at their own cost. All furnishings are standard issue and no hi-technology equipment like electronic white boards are available. There is a computer laboratory fitted to service a limited number of learners per session. Few books were seen in class reading nooks, almost exclusively Western storybooks and visual materials. Parents/caregivers were asked to rate the importance of extra-mural sports and cultural events. 53.1% reported sports as very important while only 32.9% rated cultural opportunities as important. Only 6.25% thought sport was not important at all and even more caregivers, 18.1%, thought that cultural activities were unimportant. The fact that the cultural activities on offer do not reflect the learners' African heritage but are Eurocentric (for example, participation in a school concert with exclusively western music and fairy tales) may have influenced this response. While 95% of parent/caregivers chose English as the primary medium of instruction, 47% wanted English only. Of the respondents who reported that they would prefer mother tongue to be taught for at least an hour a day alongside English, were 43.3% of Grades 1 and 2 parents in contrast to 36% of Grade 3 parents. Since a good percentage of parents saw the school as a place where the mother tongue could receive some support for language maintenance purposes, this finding raised the possibility that the younger and slightly better educated parents may be more aware of the academic benefits of in-school attention to the mother tongue. Reinforcing this impression, almost one-quarter of Grade 1 parents (22.4%) reported that it was 'extremely important' that the school encourage use of the mother tongue outside the classroom, in contrast to 12.5 and 12.6% of Grade 2 and Grade 3 parents. These findings also suggest that some parents may perceive a local/global split in language use, with the classroom representing the global and the school playground, the local. Elsewhere we discuss this matter in theoretical terms of border crossing: in moving from home to school or from classroom to playground, learners continually move back and forth between linguistic, cognitive, cultural and affective domains (Evans & Cleghorn, 2010, 2012). Unlike the parents in Nomlomo's (2010) study of parents' choice of medium of instruction for Grade 4 to 6 science in the Western Cape, People's Primary parents did not report that they were caught between the home language and English. This attitude is similar to the study done by De Klerk (2002:7) who found "strong signs of rapid shift to English, both at home and school, and in most cases, this had happened faster than expected". Generally parents of People's Primary seemed more comfortable going 'straight for English' for their children's schooling than parents in the Nomlomo (2010) study who wanted a balanced bilingual system in which their children would become literate in both the home language as well as English. Nevertheless, as the following unedited quotes suggest, there was more than a hint in our study that there were parents who would prefer mother tongue or mother tongue plus English instruction for their children. Timetable should have a "mother tongue" slot so as to preserve the local languages, however all lessons should be taught in English as it is the universal mode of communication. I believe children should first learn the L1 before learning L2. I didn't know why they teach only English. All government schools should provide mother tongue to kids equally as all languages are equal and official. This must be compulsory with immediate effect. The use of mother tongue at school will enhance the understanding of that language. Although I wish mother tongue could be conducted in our town schools I don't think it will be easy to emplement this. It is mostly a parent's job to make sure their mother tongue isn't lost by teaching them to speak at home. I'm doing it and will continue doing it. I'd like to see mother tongue being used equally as English and not to see it not being used at all while other languages are given priorities than others. I feel that my child is disadvantaged because they are taught English and no mother tongue - in fact our mother tongues are undermined same as in the apartheid era. The use of English only at schools has resulted in certain African generation to loose their history, origin, culture, tradition, moral values and pride of being Africans. This generation adopted western way of life and values in the name of civilisation, They are likely to transfer that to their off-spring. At the other extreme, however, the principal explains the more radical attitude of several parents, pointing to a very similar finding in De Klerk's (2002) research. An interesting thing is some of our black 5 parents. I had a complaint last week that the teacher is using the mother tongue in class. [Researcher: A complaint?] Yes. From black parents.They want the learners to be taught in English....But I am honest with you, my view is that our black parents actually want the teachers to speak English. So if it does not happen they are very, very quick to come and report that that teacher is not speaking in English. [Laughs] One would not expect that in the school but our school, yes, it happens. ...there are really a few complaints in the last years where they insist that they put their children here for the English, otherwise they could have put them in the township school with their mother tongue. It is unfortunate that the opportunity was missed to explain to those anxious parents that their children's achievement in school may be enhanced by code switching (Benson & Kosonen, 2013; Brock-Utne, 2005; 2013). This nested study within a larger research project sought to pin down the factors that parents consider when selecting a school for their Foundation phase child. We asked the extent to which parental school choice is linked directly to a preference for English-only instruction or influenced by other factors. From the questionnaire data as well as teacher and principal interviews, the reasons appear quite varied. The vast majority of parents have selected this school because of its reputation as a school where their children will be treated well, but strictly. They have chosen this school because of the availability of basic resources and sports. Furthermore, they feel confident that their children will receive a good education and that, in English. However, although many respondents regard parents within the domestic context as custodians of the home language, they would like to see some consideration paid to those languages within the school without such measures posing a risk to accessing English. At this juncture we believe another question needs to be posed: What choice do parents really have, considering the persistent poor quality of instruction and the state of the schools in the townships (Bloch, 2009), where many of the parents in our survey live? Do any schools at least in the urban area where People's Primary is located offer dual medium instruction? Do any of the schools offer one or more mother tongue languages as subjects? Given such choice, it would be interesting to re-examine parents' preferences for their children's schooling. Much remains speculative about how parents decide to send their children to a particular school, especially when they have several to choose from. It appears that the choice of People's Primary school over three nearby English-medium primary schools may be related to its Afrikaans historical legacy and associated reputation as a school where the learners would be well disciplined. We cannot, therefore, declare that access to instruction in English outweighs other considerations such as distance or cost since these factors would be similar for the other nearby schools. We do, however, deduce a key issue after close scrutiny of the data: a new language wave forming shaped by younger parents and their desire to maintain the mother tongue, but not at the expense of their children becoming proficient in English. As indicated earlier, we use the word 'wave' to suggest a perpetual, dynamic potentially two-way motion, while the word 'shift' connotes something that is unidirectional, complete and static. At the beginning of this article we reviewed the 'language waves' that characterise South Africa's schooling history. With People's Primary school as a case in point, the waves have gone from Dutch to Afrikaans, to parallel-medium Dutch and Afrikaans, to Afrikaans only, to parallel-medium Afrikaans and English, to English only. Our findings suggest that there is another wave to come: English with in-school attitudinal if not actual support of mother tongues. This emergent finding comes from close scrutiny of our survey questionnaire results as they relate in particular to the younger, somewhat better educated, parents of the Grade 1 children. These parents may also be aware of well-established research findings on the academic advantage of maintaining home/local languages while insuring access to English or other dominant languages such as French, Spanish and Portuguese that are important for global participation (Benson, 2004; Bunyi, 1999; Cummins & Hornberger, 2007; Holmarsdottir, 2005; Stroud, 2002; 2003; Wong-Fillmore, 1991). These perceptions seem strengthened by an apparent decrease in using English in the private domain but an unsurprising increase in the use of English in the public domain as demanded by a multilingual society. This is in contrast to the most recent South African census (Statistics South Africa, 2011) which indicates that in the past decade there has been an increase from 8.2% to 9.6% of persons who claim English as a mother tongue. Comparative statistics show the decrease to be in African languages. This being said, it is still the case that many of the older parents and care-givers favour instruction in English only for their children, perhaps without understanding the linguistic complexities of the classroom and their possible effect on learners' academic progress. What seems to be a progressive language-in-education policy in South Africa, advocating but not mandating initial instruction in the mother tongue, has not elevated the status of previously marginalised African languages in the schools. Yet the current policy which encourages learners to maintain their home language and ethnic identities - an additive approach to multilingualism has not come to fruition at People's Primary as no political will to counter the hegemony of English is apparent. English has historically been of high status in South Africa under both colonial rule and apartheid; that its use is continually spreading lies in contradiction to official policy, fitting better with contemporary national goals of establishing a racially integrated nation and 'joining the world stage' economically (Republic of South Africa, 2010; Republic of South Africa, 2001:38; see also Crystal, 2003; Heughet al., 1995; Tollefson, 1991; Tollefson & Tsui, 2004). Thus learners are encouraged to join a 'wider' societal context associated with political and economic advantages and requiring adoption of an international language, English. Yet, there are hints that public opinion may be recognising that the home language is critical for matters of personal identity and intergenerational communication (the local) while knowledge of English - oral and written, is uncritically accepted as essential for global participation. Overall, our research has aimed to add to the existing literature related to language education policy and practice in South Africa where this system has been in a process of transformation for close to 20 years. Despite emerging evidence that language of instruction policy and practice continue to evolve in South Africa, it remains the case that in several parts of Africa English is becoming the de-facto language of instruction from as early as pre-school (Cleghorn & Prochner,2010). This is due not only to pressure from parent communities (Alexander, 2000; De Klerk, 2002; Heugh, 2005; Lafon & Webb, 2008; Probyn, 2009; Republic of South Africa, 2003; 2005; Webb, 2004) but also due to the rapidly changing demographics of industrialised areas as globalisation and inter-continental migration enrich the classroom composition in terms of ethnic and dialectal variables (Farr, Seloni & Song, 2010). It would, however, seem that where parents have any choice at all, several other factors determine the school they decide on for their children. We thank the staff and parents of People's Primary for their patience and co-operation during our investigation. We express our appreciation to the University of Pretoria and the National Research Foundation (South Africa) for financing the research project. 1 In South Africa the Foundation phase refers to Grade 1 to Grade 3 followed by the Intermediate phase with the start of Grade 4. Children must start attending school in the year in which they turn seven years old. The academic year annually starts in January. 2 A national quintile of 7 would apply to the best government schools, indicating that a quintile of 5 ranks a school in the upper middle range (Section 109 of the National Norms and Standards for School Funding). 3 Twelve parents with school-going children (but not attending People's Primary) were asked to complete the questionnaire. Minor changes to wording were suggested and implemented. 4 It is possible that there was a perceived sense of risk that one's identity might be exposed by answering this question, if a respondent was living in South Africa as an illegal migrant/refugee. 5 The residual effects of apartheid are evident in this comment as an example of "othering". The principal was white. His first language was Afrikaans. All parents of learners at this school would be considered black Africans.